Leading charity mobile agency; Cymba deliver technical mobile marketing and integrated messaging solutions used by many big name charities and non-profit organisations. We also support loads of creative agencies, media agencies and fundraising agencies. Established in 2004 - we are leaders in third sector mobile marketing, messaging communications, as well as developing the UK’s first regular giving via SMS (RG PSMS) platform, called Connected. Over 65% of the UK’s best loved charities have used our services (2013). We’re proud of this. Cymba power charity mobile payments and reporting for many leading UK and international charities, providing robust, cogent systems and a mobile vantage for charity customers and fundraising partners across all direct marketing activities and fundraising channels that might benefit from a mobile response. Cymba’s relationships and technology provide accurate unique supporter analytics and ROI information for best practice donor engagement levels across all campaigns. 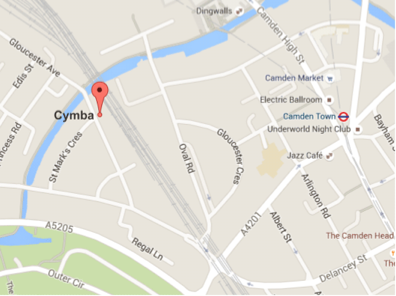 We’re based in Camden and operate throughout the UK. We are experts in mobile response, regular giving, systems integration, donor journey and loyalty programmes, and incentive driven mobile marketing promotions. Charities are putting a mobile response in the forefront of all new acquisition and regular giving strategies. Our integrated multi-channel approach includes TV, print media, face-to-face fundraising, social media and telephone fundraising. We work with all major UK fundraising agencies. We understand how mobile metrics work - from response, data security and ROI perspective.